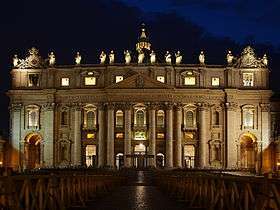 This article is about the basilica in Vatican City. For its predecessor, see Old St. Peter's Basilica. For other uses, see St. Peter's (disambiguation) and St. Peter's Church (disambiguation). St. Peter's Basilica from Ponte Umberto I, on the Tiber. 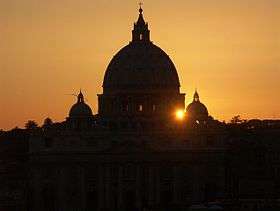 The iconic dome dominates the skyline of Rome. St. Peter's is a church in the Renaissance style located in the Vatican City west of the River Tiber and near the Janiculum Hill and Hadrian's Mausoleum. Its central dome dominates the skyline of Rome. 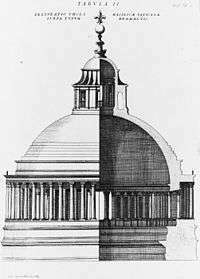 The basilica is approached via St. Peter's Square, a forecourt in two sections, both surrounded by tall colonnades. The first space is oval and the second trapezoid. The façade of the basilica, with a giant order of columns, stretches across the end of the square and is approached by steps on which stand two 5.55 metres (18.2 ft) statues of the 1st-century apostles to Rome, Saints Peter and Paul. The nave which leads to the central dome is in three bays, with piers supporting a barrel-vault, the highest of any church. The nave is framed by wide aisles which have a number of chapels off them. There are also chapels surrounding the dome. Moving around the basilica in a clockwise direction they are: The Baptistery, the Chapel of the Presentation of the Virgin, the larger Choir Chapel, the Clementine Chapel with the altar of Saint Gregory, the Sacristy Entrance, the left transept with altars to the Crucifixion of Saint Peter, Saint Joseph and Saint Thomas, the altar of the Sacred Heart, the Chapel of the Madonna of Colonna, the altar of Saint Peter and the Paralytic, the apse with the Chair of Saint Peter, the altar of Saint Peter raising Tabitha, the altar of the Archangel Michael, the altar of the Navicella, the right transept with altars of Saint Erasmus, Saints Processo and Martiniano, and Saint Wenceslas, the altar of Saint Basil, the Gregorian Chapel with the altar of the Madonna of Succour, the larger Chapel of the Holy Sacrament, the Chapel of Saint Sebastian and the Chapel of the Pietà. At the heart of the basilica, beneath the high altar, is the Confessio or Chapel of the Confession, in reference to the confession of faith by St. Peter, which led to his martyrdom. Two curving marble staircases lead to this underground chapel at the level of the Constantinian church and immediately above the purported burial place of Saint Peter. The entire interior of St. Peter's is lavishly decorated with marble, reliefs, architectural sculpture and gilding. The basilica contains a large number of tombs of popes and other notable people, many of which are considered outstanding artworks. 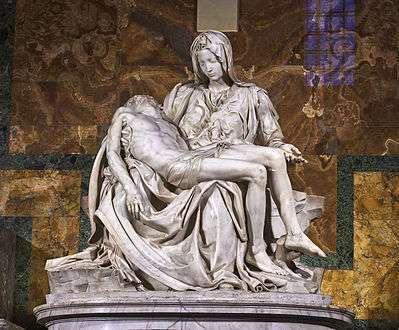 There are also a number of sculptures in niches and chapels, including Michelangelo's Pietà. The central feature is a baldachin, or canopy over the Papal Altar, designed by Gian Lorenzo Bernini. 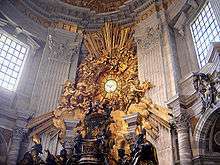 The sanctuary culminates in a sculptural ensemble, also by Bernini, and containing the symbolic Chair of Saint Peter. It is the most prominent building in the Vatican City. Its dome is a dominant feature of the skyline of Rome. Probably the largest church in Christendom, it covers an area of 2.3 hectares (5.7 acres). One of the holiest sites of Christianity and Catholic Tradition, it is traditionally the burial site of its titular, St. Peter, who was the head of the twelve Apostles of Jesus and, according to tradition, the first Bishop of Antioch and later the first Bishop of Rome, rendering him the first Pope. 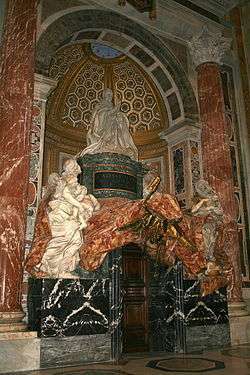 Although the New Testament does not mention St. Peter's martyrdom in Rome, tradition, based on the writings of the Fathers of the Church, holds that his tomb is below the baldachin and altar of the Basilica in the "Confession". For this reason, many Popes have, from the early years of the Church, been buried near Pope St. Peter in the necropolis beneath the Basilica. 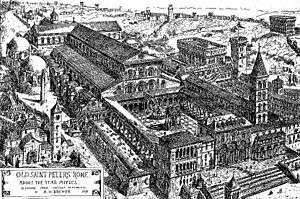 Construction of the current basilica, over the old Constantinian basilica, began on 18 April 1506. 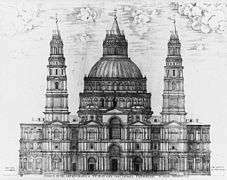 At length, on 18 November 1626 Pope Urban VIII solemnly dedicated the Basilica. 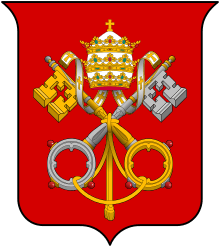 As one of the constituent structures of the historically and architecturally significant Vatican City, St. Peter's Basilica was inscribed as a UNESCO World Heritage Site in 1984 under criteria (i), (ii), (iv), and (vi). With an exterior area of 21,095 square metres (227,060 sq ft), an interior area of 15,160 square metres (163,200 sq ft), and a volume of 5,000,000 cubic metres (180,000,000 cu ft), St. Peter's Basilica is the largest Christian church building in the world by the two latter metrics and the second largest by the first as of 2016. The top of its dome, at 448.1 feet (136.6 m), also places it as the second tallest building in Rome as of 2016. The dome's soaring height placed it among the tallest buildings of the Old World, and it continues to hold the title of tallest dome in the world. Though the largest dome in the world by diameter at the time of its completion, it no longer holds this distinction. It is believed by a long tradition that Peter, after a ministry of thirty-four years, traveled to Rome and met his martyrdom there along with Paul on 13 October, AD 64 during the reign of the Roman Emperor Nero. 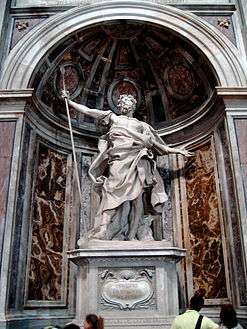 His execution was one of the many martyrdoms of Christians following the Great Fire of Rome. According to Origen, Peter was crucified head downwards, by his own request because he considered himself unworthy to die in the same manner as Jesus. The crucifixion took place near an ancient Egyptian obelisk in the Circus of Nero. The obelisk now stands in St. Peter's Square and is revered as a "witness" to Peter's death. It is one of several ancient Obelisks of Rome. 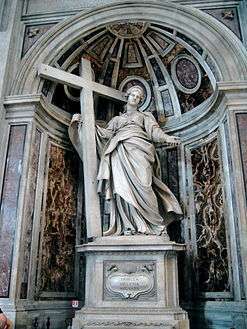 According to tradition, Peter's remains were buried just outside the Circus, on the Mons Vaticanus across the Via Cornelia from the Circus, less than 150 metres (490 ft) from his place of death. The Via Cornelia was a road which ran east-to-west along the north wall of the Circus on land now covered by the southern portions of the Basilica and St. Peter's Square. Peter's grave was initially marked simply by a red rock, symbolic of his name. A shrine was built on this site some years later. Almost three hundred years later, Old St. Peter's Basilica was constructed over this site. Old St. Peter's Basilica was the 4th-century church begun by the Emperor Constantine the Great between 319 and 333 AD. 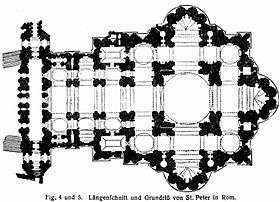 It was of typical basilical form, a wide nave and two aisles on each side and an apsidal end, with the addition of a transept or bema, giving the building the shape of a tau cross. It was over 103.6 metres (340 ft) long, and the entrance was preceded by a large colonnaded atrium. This church had been built over the small shrine believed to mark the burial place of St. Peter. It contained a very large number of burials and memorials, including those of most of the popes from St. Peter to the 15th century. Like all of the earliest churches in Rome, both this church and its successor had the entrance to the east and the apse at the west end of the building. Since the construction of the current basilica, the name Old St. Peter's Basilica has been used for its predecessor to distinguish the two buildings. On 7 December 2007, a fragment of a red chalk drawing of a section of the dome of the basilica, almost certainly by the hand of Michelangelo, was discovered in the Vatican archives. 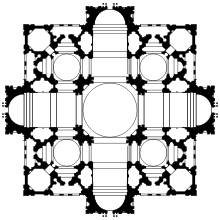 The drawing shows a small precisely drafted section of the plan of the entabulature above two of the radial columns of the cupola drum. Michelangelo is known to have destroyed thousands of his drawings before his death. The rare survival of this example is probably due to its fragmentary state and the fact that detailed mathematical calculations had been made over the top of the drawing. Behind the façade of St. Peter's stretches a long portico or "narthex" such as was occasionally found in Italian Romanesque churches. This is the part of Maderno's design with which he was most satisfied. Its long barrel vault is decorated with ornate stucco and gilt, and successfully illuminated by small windows between pendentives, while the ornate marble floor is beamed with light reflected in from the piazza. At each end of the narthex is a theatrical space framed by ionic columns and within each is set a statue, an equestrian figure of Charlemagne by Cornacchini (18th century) in the south end and Constantine the Great by Bernini (1670) in the north end. Bernini's first work at St. Peter's was to design the baldacchino, a pavilion-like structure 30 metres (98 ft) tall and claimed to be the largest piece of bronze in the world, which stands beneath the dome and above the altar. Its design is based on the ciborium, of which there are many in the churches of Rome, serving to create a sort of holy space above and around the table on which the Sacrament is laid for the Eucharist and emphasizing the significance of this ritual. These ciboria are generally of white marble, with inlaid coloured stone. 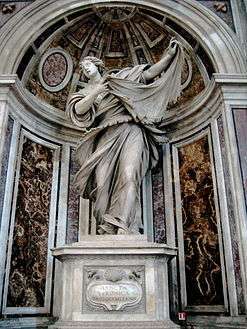 Bernini's concept was for something very different. 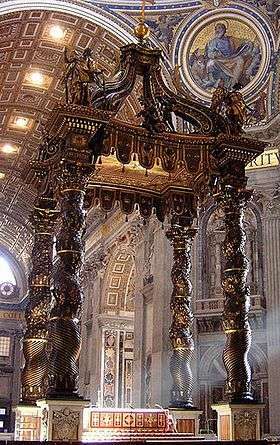 He took his inspiration in part from the baldachin or canopy carried above the head of the pope in processions, and in part from eight ancient columns that had formed part of a screen in the old basilica. Their twisted barley-sugar shape had a special significance as they were modeled on those of the Temple of Jerusalem and donated by the Emperor Constantine. 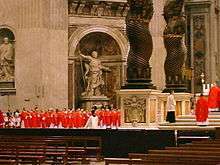 Based on these columns, Bernini created four huge columns of bronze, twisted and decorated with laurel leaves and bees, which were the emblem of Pope Urban. To the east of the basilica is the Piazza di San Pietro, (St. Peter's Square). The present arrangement, constructed between 1656 and 1667, is the Baroque inspiration of Bernini who inherited a location already occupied by an Egyptian obelisk which was centrally placed, (with some contrivance) to Maderno's facade. The obelisk, known as "The Witness", at 25.5 metres (84 ft) and a total height, including base and the cross on top, of 40 metres (130 ft), is the second largest standing obelisk, and the only one to remain standing since its removal from Egypt and re-erection at the Circus of Nero in 37 AD, where it is thought to have stood witness to the crucifixion of St Peter. Its removal to its present location by order of Pope Sixtus V and engineered by Domenico Fontana on 28 September 1586, was an operation fraught with difficulties and nearly ending in disaster when the ropes holding the obelisk began to smoke from the friction. Fortunately this problem was noticed by Benedetto Bresca, a sailor of Sanremo, and for his swift intervention, his town was granted the privilege of providing the palms that are used at the basilica each Palm Sunday. There are over 100 tombs within St. Peter's Basilica (extant to various extents), many located in the Vatican grotto, beneath the Basilica. These include 91 popes, St. Ignatius of Antioch, Holy Roman Emperor Otto II, and the composer Giovanni Pierluigi da Palestrina. Exiled Catholic British royalty James Francis Edward Stuart and his two sons, Charles Edward Stuart and Henry Benedict Stuart, Cardinal Bishop of Frascati, are buried here, having been granted asylum by Pope Clement XI. Also buried here are Maria Clementina Sobieska, wife of James Francis Edward Stuart, Queen Christina of Sweden, who abdicated her throne in order to convert to Catholicism, and Countess Matilda of Tuscany, supporter of the Papacy during the Investiture Controversy. The most recent interment was Pope John Paul II, on 8 April 2005. Beneath, near the crypt, is the recently discovered vaulted 4th-century "Tomb of the Julii". (See below for some descriptions of tombs). Of the five portals from the narthex to the interior, three contain notable doors. The central portal has the Renaissance bronze door by Antonio Averulino (called Filarete) (1455), enlarged to fit the new space. 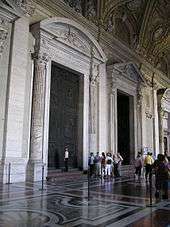 The southern door, the "Door of the Dead", was designed by 20th-century sculptor Giacomo Manzù and includes a portrait of Pope John XXIII kneeling before the crucified figure of St. Peter. John Paul II, Pontifex Maximus, opened and closed again the holy door closed and set apart by Paul VI in 1976 in the jubilee year of human redemption 1983–4. 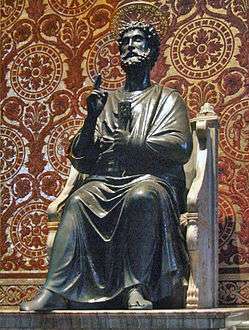 Set against the north east pier of the dome is a statue of St. Peter Enthroned, sometimes attributed to late 13th-century sculptor Arnolfo di Cambio, with some scholars dating it to the 5th century. One foot of the statue is largely worn away by pilgrims kissing it for centuries. The sunken Confessio leading to the Vatican Grottoes (see above) contains a large kneeling statue by Canova of Pope Pius VI, who was captured and mistreated by Napoleon Bonaparte's army. Set in niches within the four piers supporting the dome are the statues associated with the basilica's primary holy relics: Saint Helena holding the True Cross and the Holy Nails, by Andrea Bolgi; Saint Longinus holding the spear that pierced the side of Jesus, by Bernini (1639); Saint Andrew with the St. Andrew's Cross, by Francois Duquesnoy and Saint Veronica holding her veil with the image of Jesus' face, by Francesco Mochi. At the end of the aisle is an altar containing the relics of St. Petronilla and with an altarpiece The Burial of St Petronilla by Guercino (Giovanni Francesco Barbieri), 1623. Interior length including vestibule: 693.8 feet (211.5 m), more than ⅛ mile. 1 2 Banister Fletcher, the renowned architectural historian calls it "the greatest creation of the Renaissance" and "... the greatest of all churches of Christendom" in Fletcher 1996, p. 719. 1 2 Claims made that the Basilica of Our Lady of Peace of Yamoussoukro in Côte d'Ivoire is larger appear to be spurious, as the measurements include a rectorate, a villa and probably the forecourt. Its dome, based on that of St. Peter's Basilica, is lower but carries a taller cross, and thus claims to be the tallest domed church. ↑ James Lees-Milne describes St. Peter's Basilica as "a church with a unique position in the Christian world" in Lees-Milne 1967, p. 12. 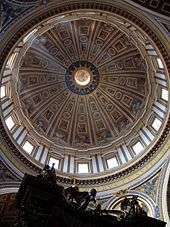 ↑ "St. Peter's Basilica (Basilica di San Pietro) in Rome, Italy". reidsitaly.com. ↑ "St. Peter's Square – Statue of St. Paul". saintpetersbasilica.org. Retrieved 22 December 2010. ↑ The Treaty of the Lateran by Benedict Williamson; London: Burns, Oates, and Washbourne Limited, 1929; pages 42–66). 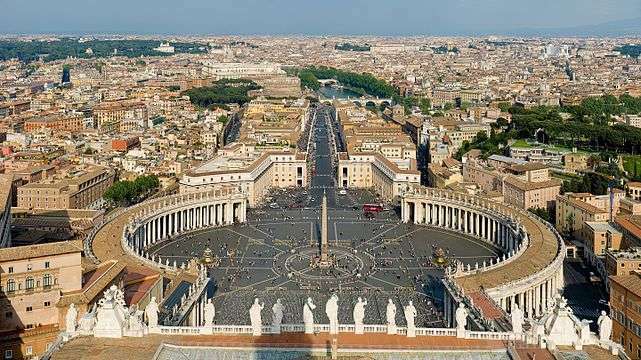 This is in contrast to the other three Papal Major Basilicas, which are within Italian territory and not the territory of the Vatican City State. 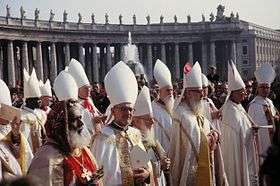 (Lateran Treaty of 1929, Article 15 (Ibidem)) However, the Holy See fully owns these three basilicas, and Italy is legally obligated to recognize its full ownership thereof (Lateran Treaty of 1929, Article 13 (Ibidem)) and to concede to all of them "the immunity granted by International Law to the headquarters of the diplomatic agents of foreign States" (Lateran Treaty of 1929, Article 15 (Ibidem)). 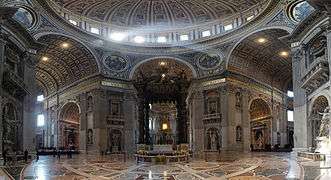 ↑ "St. Peter's Basilica — Interior of the Basilica". Internet Portal of the Vatican City State. p. 2. Archived from the original on 26 February 2009. Retrieved 2 January 2009. ↑ Centre, UNESCO World Heritage. 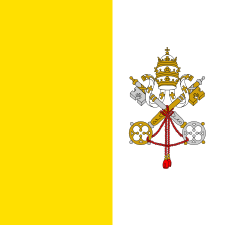 "Vatican City". whc.unesco.org. Retrieved 2016-08-09. ↑ "St. Peter's - The Nave". Saintpetersbasilica.org. Retrieved 9 August 2016. ↑ Ellis, Edward Robb (21 December 2004). The Epic of New York City: A Narrative History. Basic Books. p. 413. ISBN 978-0-7867-1436-0. Retrieved 2016-08-09. (subscription required (help)). ↑ Fodor's Travel Guides (2014). Fodor's Italy 2015. Travel Distribution. ISBN 0-8041-4291-2 – via Google Books. 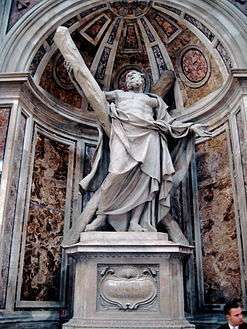 ↑ "Catholic Encyclopedia: St. Peter, Prince of the Apostles". New Advent. 1 February 1911. Retrieved 28 March 2011. ↑ Hijmans, Steven. "University of Alberta Express News". In search of St. Peter's Tomb. Archived from the original on 25 January 2006. Retrieved 25 December 2006. ↑ Boorsch, Suzanne (Winter 1982–1983). 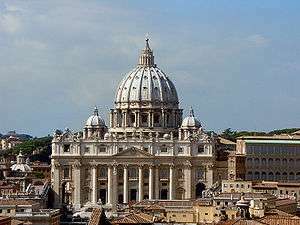 "The Building of the Vatican: The Papacy and Architecture". The Metropolitan Museum of Art Bulletin. 40 (3): 4–8. ↑ Quarrying of stone for the Colosseum had, in turn, been paid for with treasure looted at the Siege of Jerusalem and destruction of the temple by the emperor Vespasian's general (and the future emperor) Titus in 70 AD., Claridge, Amanda (1998). Rome: An Oxford Archaeological Guide (First ed.). Oxford, UK: Oxford University Press, 1998. pp. 276–282. ISBN 0-19-288003-9. ↑ "Johann Tetzel", Encyclopaedia Britannica, 2007: "Tetzel's experiences as a preacher of indulgences, especially between 1503 and 1510, led to his appointment as general commissioner by Albrecht, archbishop of Mainz, who, deeply in debt to pay for a large accumulation of benefices, had to contribute a considerable sum toward the rebuilding of St. Peter's Basilica in Rome. Albrecht obtained permission from Pope Leo X to conduct the sale of a special plenary indulgence (i.e., remission of the temporal punishment of sin), half of the proceeds of which Albrecht was to claim to pay the fees of his benefices. In effect, Tetzel became a salesman whose product was to cause a scandal in Germany that evolved into the greatest crisis (the Reformation) in the history of the Western church." ↑ The dome of Florence Cathedral is depicted in a fresco at Santa Maria Novella that pre-dates its building by about 100 years. Galassi Alghisii Carpens., apud Alphonsum II. Ferrariae Ducem architecti, opus, by Galasso Alghisi, Dominicus Thebaldius (1563). page 44/147 of Google PDF download. 1 2 "Michelangelo 'last sketch' found". BBC News. 7 December 2007. Retrieved 8 December 2007. ↑ Kilby, Peter. "St Peter's Basilica (Basilica di San Pietro)". Retrieved 27 July 2011. ↑ The obelisk was originally erected at Heliopolis by an unknown pharaoh of the Fifth dynasty of Egypt (c. 2494 BC – 2345 BC). ↑ "St. Peter's, the Obelisk". saintpetersbasilica.org. Retrieved 22 December 2010. 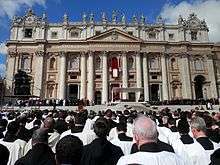 ↑ "The Seminarian GuidesNorth American College, Rome". saintpetersbasilica.org. Retrieved 29 July 2009. ↑ "Since Nicholas V twenty-seven popes over a span of 178 years had imagined this day. They had already spent 46 800 052 ducats (...) And still the building was not done. The basic construction was complete, but the last genius (Bernini) to put his signature on the Basilica was just beginning his work." in Scotti 2007, p. 241. Baumgarten, Paul Maria (1913). "Basilica of St. Peter". In Herbermann, Charles. Catholic Encyclopedia. New York: Robert Appleton Company. ⸻ (2001) [First published 1896]. Sir Banister Fletcher's a History of Architecture (20th ed.). London: Architectural Press. ISBN 0-7506-2267-9. McClendon, Charles (1989). 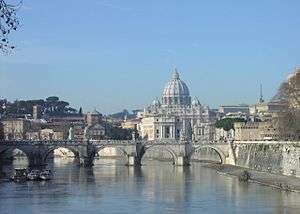 "The History of the Site of St. Peter's Basilica, Rome". Perspecta: the Yale Architectural Journal. MIT Press. 25: 32–65. doi:10.2307/1567138. ISSN 0079-0958. JSTOR 1567138.